All of the great leaders have had one characteristic in common: it was the willingness to confront unequivocally the major anxiety of their people in their time. This, and not much else, is the essence of leadership. —John Kenneth Galbraith. There are three kinds of people: Those you meet and instantly forget a few minutes later. Those that give you a negative impression when you meet them, and those that leave long-lasting pleasant memories after you’ve met them. I am Onyeizu Chinedu from Obingwa LGA of Abia State; a Harvard University trained professional and a Petroleum Engineering graduate of the Federal University of Technology, Owerri. In late 2002, I was posted to Bayelsa State as a “Batch A” National Youth Service Corp member. After the three weeks orientation camp, I was assigned to serve in Kiama Grammar School, Kolokuma/Opokuma Local Government Area; where I taught physics and mathematics. Of course, I had a pleasant experience teaching in the community school and hanging out with friends and other corps members most evenings under the famous Kiama bridge. One of the most significant incidents of my youth service experience occurred outside the classroom and it started with a visit from an elderly friend of mine, Papa, who supplied fresh plantain and fish to corpers. Anytime he visited, I observed a cloudy white substance that covered a large part of his right eye. While we conversed, I remembered we were encouraged at the NYSC orientation camp to engage in group or personal community development projects (CDP). So the idea of surfing the net for an NGO to help the old man came to my mind, at the same time, as a corps member who had benefited from his free food, I decided to make it a personal CDP and explore any opportunity to relieve his condition. Initially, I pondered whether my meager N11,500 monthly allowance popularly referred to as allowee will be enough to accommodate an extra investment in a humanitarian initiative and also sustain me in Kiama village. But since Papa wouldn’t hesitate to share his bunch of plantain, which is actually all that he had, I didn’t waste time to conclude that any effort to restore Papa’s sight will be worth my time, energy and allowance. The first thing I did was to register the initiative as an NYSC CDP. Afterwards, I started researching to learn about the name and cause of his eye infection. When I was told it was cataract, I started surfing the net on weekends to either find a group, an NGO or a medical institution that will be willing to offer free eye service surgery to Papa. As luck could have it, I found a medical charity in the United Kingdom, “Sight 2020 Direct”. I wrote them an e-mail, asking whether they could come to Bayelsa for a free eye surgery camp. After several e-mail exchanges, I was able to convince the group to come. However, I didn’t know that I had a big bureaucratic hurdle to jump with the state government ministries. For common sense sake, we are referring to a group of ophthalmologists and nurses that are coming to carry out a free, again free eye saving surgery for cataract blind persons in the state. With the assumption that government officials would be enthusiastic about the project, I reached out to the Bayelsa State Commissioner for Health and the numerous special advisers to the Governor on health matters. To my utmost surprise, I was turned to a ping pong “Chinedu come tomorrow, Chinedu the commissioner is busy with an important delegation, Chinedu the initiative is laudable, we will consider it and call you, Chinedu do a formal application using the NYSC letterhead etc.” After three months of seeking for help and support from the government, I exhausted my resources and the resources of the corps members that volunteered to help. At a point, my small team and I decided to organize the eye camp on our own. We informed the NYSC state office and got approval to go ahead with a humanitarian branded message and creative ideas on how to execute the project. We started making progress as more corps members volunteered to join. Soon we had opticians, medical doctors, etcin the team. We set up make shift diagnostic centers across the state, used opticians that volunteered in areas outside Yenagoa. Within weeks, we registered over 50 blind patients and conducted visual acuity tests on them. I remember organizing a sensitization road walk along the major streets of Yenagoa wearing a white T-shirt; we branded “Sight for all Bayelsans in 2003”. Because we had no money, we produced the road walk T-shirts out of a cardboard paper cut-out and then used diluted oil paints to write on it. However, the Bayelsa Radio and TV stations agreed to place our public announcements and jingles on air free of charge. That leverage helped us reach out to patients that reside far from Yenagoa. I hardly slept for two hours in a day. I would co-ordinate and plan project deliverables with the volunteer optometrists, follow up on other corp members that volunteered to support logistics and at the same time pursue the ministries responsible for health matters in the state. But determination and the passion to serve our nation kept us going. When the UK- medical team landed in Port Harcourt airport on November 14, 2003, I still had no financial or logistical support from any government agency. Meanwhile patients had started contacting medical officials in Okolobiri General Hospital. Before I made the last move towards getting the state government’s attention, I said a quick prayer in my mind. I asked God to intervene; at least for the sake of the poor blind persons that have made it out of the creeks to receive sight saving surgeries. This final move was to visit the head of a Bayelsa youth organization. I met him and explained my ordeal with the state government ministries. He apologized and asked whether I met with the state deputy governor, Dr. Goodluck Jonathan. 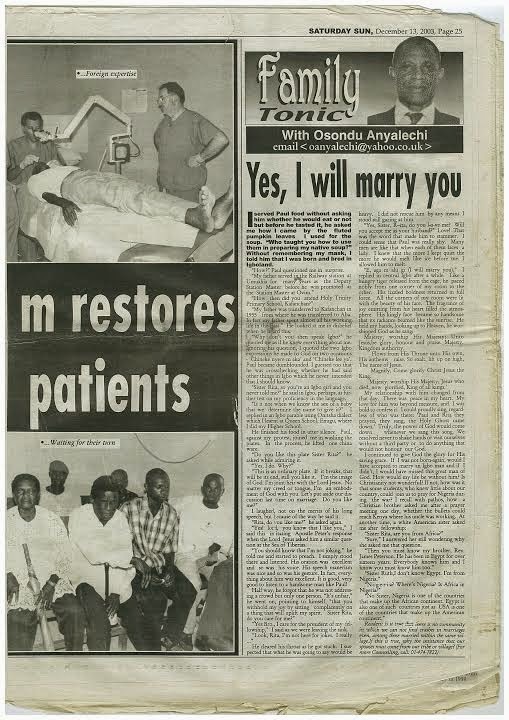 I said no; but that if any help has to come, it should be quick because the expatriate doctors were already on their way to Bayelsa from Port Harcourt International Airport. He made some calls and asked me to quickly get into his vehicle. We drove down to the Bayelsa State Government House and we were ushered into the deputy governor’s office. We logged in our names and after a few minutes we went into Dr. Goodluck Jonathan’s office. I told him about the free eye surgery programme and my fruitless efforts to get support from the state ministries. I was specific, I asked him for three things: accommodation, security, and transportation. After listening to me, he smiled and thanked me for initiating such a laudable project in Bayelsa State. You may wait at the reception.” His voice was gentle, like he was giving me a suggestion, not an order. I left his office and waited at the reception room. I was exhausted and anxious, still praying in my heart for a miracle to happen. As God could have it, the Chief of Staff soon appeared and relayed a message from Dr. Jonathan. “You will be provided a coaster bus, five mobile policemen and accommodation at Intercontinental Hotel, Yenagoa. In addition, they gave me the sum of two hundred and fifty thousand naira to purchase medical equipments for the project. I couldn’t believe my ears. To me it was a modern day miracle; especially after passing through hell in the last couple of months. The free eye surgery programme started on Tuesday, November 18, 2003, at Okolobiri General Hospital. The Sight 2020 Direct team performed a total of sixty-eight surgical operations; removing cataracts and inserting intraocular lenses. Over sixty-eight blind indigenes of Bayelsa State had their eyesight restored at the end of the programme–The full story was published on pages 24-25 of the December 13th,2003 SUN Newspapers. Twelve years have gone by since my youth service in Bayelsa State, but I have never stopped wondering what would have happened to that free eye surgery programme if Dr. Goodluck Jonathan hadn’t intervened. What would have happened to Papa and the other 67 blind patients? I strongly believe that Dr. GoodluckEbele Jonathan certainly belongs to the group of individuals who give long-lasting positive memories. He addressed the major anxiety of his people at a time it was needed. Although we met for less than ten minutes, his prompt action that fateful day had a huge impact on my life and the lives of those 68 patients. From that brief encounter with him, I learned that persistence pays off. Problems and challenges may obstruct your progress, but if you believe in yourself and your goal, you will eventually succeed. I remember waiting for hours, particularly at the ministry of health with nobody paying attention to me. 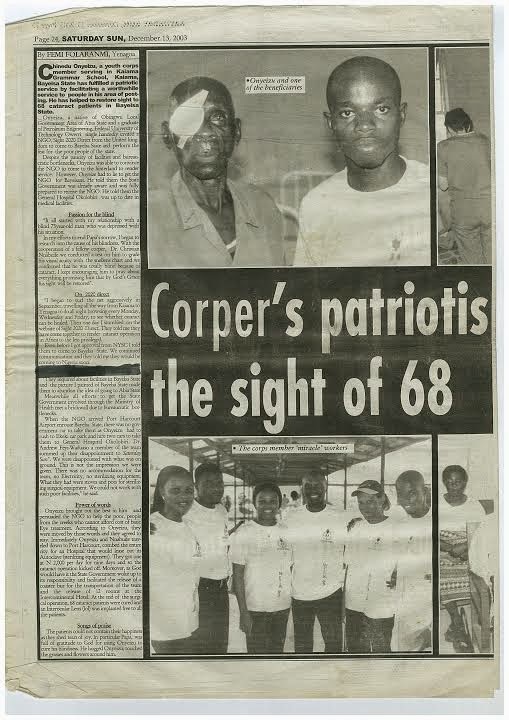 I remember being referred to this or that special adviser, and being forced to use my meager corper allowance of N11, 500 (less than $100 today) to support the free eye surgery programme. Despite these initial setbacks, the breakthrough finally came. The second thing I learned from my encounter with Dr. Jonathan is that there are government officials who genuinely care about the welfare of Nigerians and strive to improve lives. Even in the midst of corruption and apathy, you’ll find God-fearing leaders who provide immediate solutions to pressing problems. The last thing I will like people to take away is that it’s okay to aim high. I could have donated textbooks to the students of Kiama Grammar School and registered the donation with NYSC as a personal community development initiative. But I decided to aim high and impact as many lives as possible, and thanks to Dr. Goodluck Jonathan, I succeeded. These three lessons inspired me to share my national youth service experience with Nigerian youths and with those who find it difficult to cope with government bureaucracy and the challenges of life. A lot has been written about the upcoming February 14 presidential election, and most of the debate revolves around speculation. I already know my choice for the office of the president and it is based on personal experience, not fantasy or rumors. He might not be a perfect president; but he is a man that can listen and act;especially when approached with solutions to our national problems. 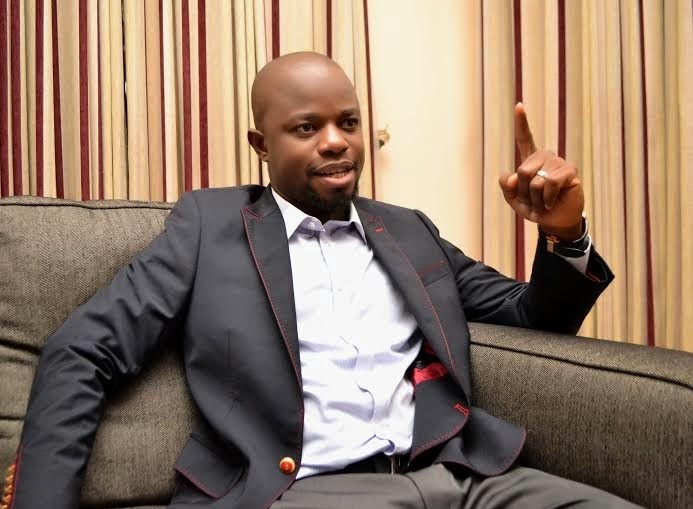 However, my vote will go to the affable former deputy governor of Bayelsa State who believed in a youth corper and acted promptly to improve the health of the helpless.